Yesterday I learned a valuable lesson, one that could potentially save you hundreds (if not thousands) of dollars. I was on the schedule to play electric guitar at my church. The entire rehearsal I was fighting the guitar. There was a certain tone I wanted, and I just wasn’t getting it. I made it work, but I wasn’t terribly happy. Sunday morning, I decided to grab my Ibanez Artcore semi-hollowbody guitar and take it with me. As soon as I plugged it in and played a note, I knew this was the right guitar for the job. Now, there was an internal struggle going on. On the one hand, I have this beautiful, Pelham blue Les Paul (a $1200 guitar with upgraded pickups). On the other hand, I have this less-flashy, $400 Ibanez Artcore guitar with stock pickups. I came SO close to using the Les Paul, for the same reason people will use their most expensive mic, even if it doesn’t sound right for the job — it’s more expensive, therefore it must be better. Thankfully, I came to my senses and trusted my instincts, and I’m glad I did. Am I saying that the Les Paul was a waste? No, not at all. But on that particular day, playing those particular songs, it wasn’t the right choice. So I’m calling this the “-$800 lesson.” Sometimes the piece of gear that costs one-third as much as another piece of gear is the right item for the job. And I’m finding that to be the case more and more, which explains why I usually use stock plugins when I mix a song. They give me what I need. 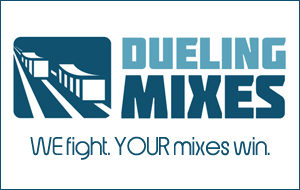 You can see me in action as a Dueling Mixes member. Get your free sneak peak right here.